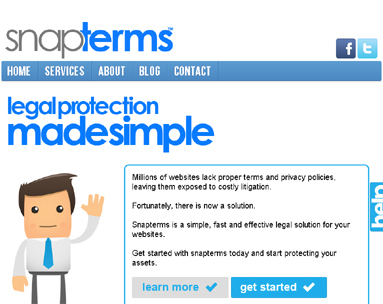 Snapterms has made it simple and affordable to get the proper legal protection you need for your website. Many websites lack proper terms and privacy policies which can leave you exposed to legal action. Snapterms has streamlined the process and passed the savings to you. Your options now are to copy another sites terms, which is copyright infringement, or hire an expensive attorney. Snapterms has filled the void between those and made it possible for anyone to properly protect their website/startup.